I was cleaning out my craft room recently and before discarding my stash of old magazines I decided to go through them. In an old issue of CardMaker Magazine from March 2011 I found this flower pot pocket card I had bookmarked to make but never did. My card isn’t exactly like the one in the magazine. I changed up my flowers and made some different leaves, but the concept is the same. You start with a 9 x 4 ½ inch piece of cardstock and fold it in half. You end up with a 4 ½ x 4 ½ inch square card. The folded edge becomes the bottom of your flower pot. Cut up both sides at an angle to look like a flower pot. Then cut a 4 ½ x 1 ¾ inch strip to form the rim of the flower pot. Using a scallop punch or other decorative edge punch, punch along the bottom edge of the rim piece. Sponge the edges of the flower pot and rim piece. Close the card by attaching a very thin strip of adhesive on both sides of the flower pot piece, leaving the top open to form the pocket. 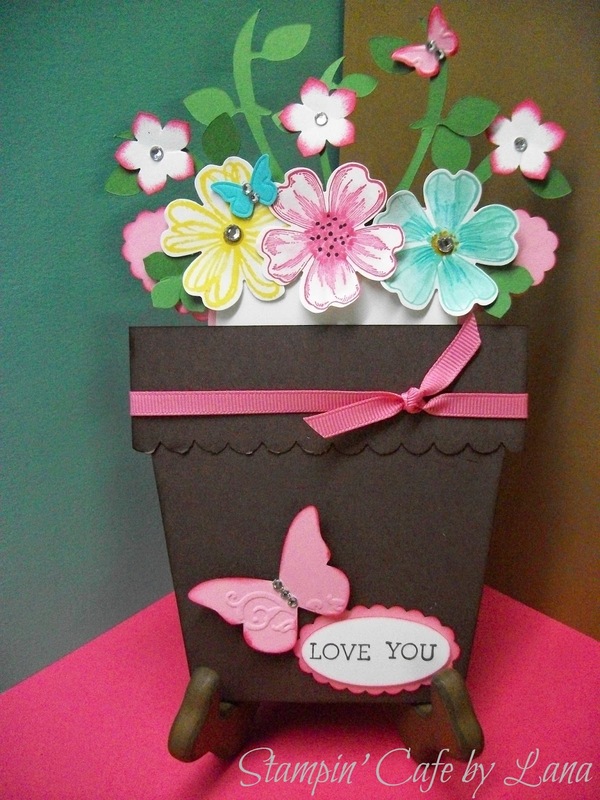 Attach the rim piece to the top edge of the flower pot card. For the inside pullout, cut a 2 ½ x 4 ½ inch piece of white card stock and stamp your greeting in about the middle of the piece. Be sure to leave room for your flowers on the top 1 ½ inches of the pull-out piece. Mat this to another piece of colored cardstock, leaving a small border on all sides. To this inside pullout piece, attach cut-out paper flowers, leaves, butterflies, or whatever else you would like. You do have to be mindful that whatever is attached has to be attached very well because this is the piece that is going to be pulled out from the card. Decorate the flower pot as desired. Add a greeting and ribbon and you are done! I thought this would make a great Mother’s Day Card and can be customized to whatever color combinations you like! It takes a little time, but when I am in my craft room time flies! Thanks for stopping by to visit. Let me know what you think!